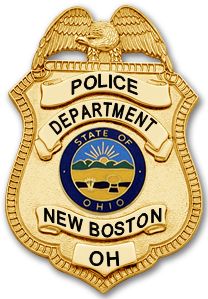 "Serving Our Village Since 1906"
The New Boston Police Department is located in Scioto County, Ohio and serves the citizens of the Village of New Boston. Our Department is a full time professional law enforcement agency that operates twenty four hours a day, seven days a week. We serve a community of 2,300 residents and our daytime population can be around 4,000 to 6,000 people that work, shop, and travel through our village, within a 2 mile square area. New Boston borders the City of Portsmouth which has a population of 20,000 residents and Wheelersburg (Porter Township) with a population of about 15,000 residents is located two miles East of New Boston. Scioto County currently has a population of 79,499 residents. We dispatch all emergency calls for police, fire and ambulance within our 911 dispatch center for the Village of New Boston and we currently average around 7,000 calls for service per year. The Ordinances of New Boston currently has in place positions for 10 full time police officers and four full time dispatchers. We also have two part-time police officers and one part-time dispatcher. All employees are trained and certified to be able to serve our community in a reliable and professional way. We are a certified six hour holding jail facility for prisoners that are arrested and held. The Police Department is also a participant of the U.S. Marshals for Southern Ohio Fugitive Apprehension Strike Team (SOFAST). On April 24th, 2019 at 9:00a.m. the Pre-School Children from New Boston Schools will make a visit to the New Boston Police Department and New Boston Fire Department. Starting April 8th for the next 5 to 6 weeks, West Avenue will be closed between Rhodes Avenue and Stanton Avenue for sewer line construction.